Home » 5 Freshest » Sour Punch Bits Tangerine & Lemonade. They’re Orange At Least. 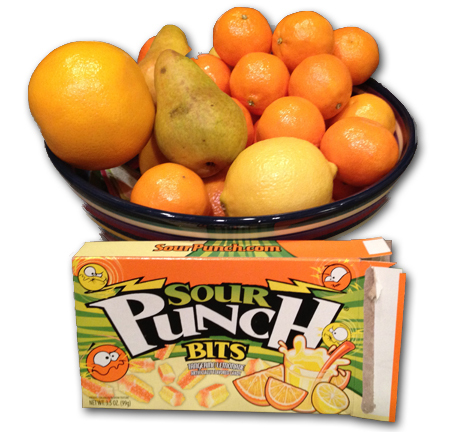 Sour Punch Bits Tangerine & Lemonade. They’re Orange At Least. Oh joy! Finally, a Candy Gurus review of a commonplace American candy! The kind you can find at any pharmacy, grocery store, and certainly any decent candy store. Time to rejoice, right? ..is like an alien vomit bag. How disappointing is this? See how they look blurry? they’re not. They’re…gooey. Little weird tubes of not that sour not at all chewy…disgustingness. But maybe they taste good, right? Well, I was optimistic. As soon as I popped one in the ‘ol soup cooler, I knew we had a failure on our hands. I guess I was hoping that these would harken back to the extremely excellent sour strawberry bites from bevmo I reviewed last year. Not even close. These are spongy, which is off putting immediately. 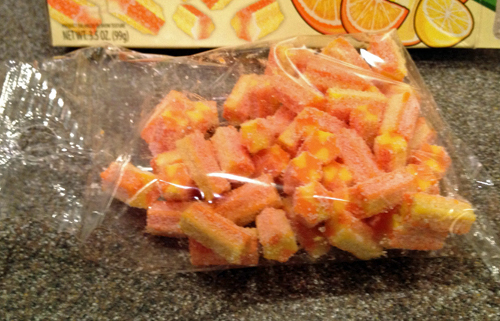 No resistance to chew, with no real flavor, just a general mild citrus attempt…extremely lame. A little bit grainy, almost like chewing on something that was originally used as a cleaning product and then was re purposed as “food”. Let’s put it this way: I gave them to Jonny Guru Jr.
See, kids are stupid. But even more than that, they like candy even more than juvenile 40 something’s like me. 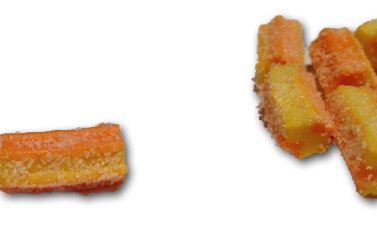 So when I get candy sent to the Gurus for review that’s…not the best, it goes in Jr’s candy pumpkin. He’s the only kid I know who’s Halloween pumpkin stay full-and I mean jam-packed loaded-all year round. Yet even Jr., with only 6 years of fairly decent public school education, hasn’t reached for these. Not even once. He had one the day I tried them, and as I announced how they sucked, he responded by saying he liked them. So clearly, he’s a liar too. Anyway, bottom line on these is that they’re not good. They won’t satisfy your chewy gummy craving, and they won’t satisfy your sour craving, and they won’t satisfy your flavor craving. I LOVE tangerine and lemon flavors perhaps more than any others. I hated these. They also fail in the tactical department-they stick to your hands, they’re gooey, …blecch. Avoid. But if you must, click on the link below…or, ..on second thought-ya know what? No. I’m not enabling any of you to take in this crap. You can thank me later. This is the kind of review I want to read more of on this site. Funny. Real. Sick.